AquaClean EZ Robotic Pool Cleaner ACLEAN4 - Free Shipping! 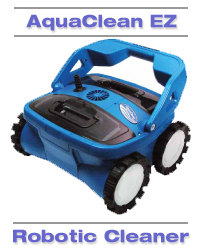 AquaClean EZ Robotic cleaner is designed to efficiently clean all pool shapes and surfaces with fewer chemicals for a healthier clean. This product is ETL Listed to UL Standard 1081, the highest certification for safety and reliability in the industry.